Are you preparing for your next big move? 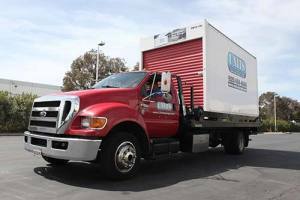 Whether you’re upgrading to a newer, bigger home or relocating for a brand new job, UNITS portable storage in Alameda wants to be there to help you. We offer moving and storage solutions in Alameda and nearby areas, facilitating your move and helping to make the new chapter of your life a little less stressful. Don’t mess with big, cumbersome moving trucks. Instead, let us deliver a UNIT (or two or three) to your location, you fill it up at your own pace, and we’ll truck it around for you! Not ready to move into your new place quite yet? UNITS portable storage in Alameda can also store your belongings for a monthly fee. Your items will be secure at our warehouse, which is under 24/7 surveillance. Eliminate some stress from your life – choose UNITS for your Alameda portable storage needs today. When you choose UNITS for your moving needs, you’re allowed to go at your own pace. We deliver our storage containers, you fill it up at a rate that is comfortable for you, and then let us know when you’re ready to have them picked up. Underestimated how much stuff you have? We can always deliver additional UNITS to your door. Driving a moving truck can be a recipe for disaster (especially with that wide turn radius). Why not leave the truck driving up to the professionals? We’ll truck your belongings to our warehouse or to your new address, whether it’s local or long-distance. Our UNITS are amazing, offering protection against mold, UV rays, water, and theft. Our UNITS also have transparent roofs so that you aren’t fumbling around in the dark as you try to pack your things. Choose between 8 x 12 and 8 x 16 foot containers for your individual needs. Maybe you need two big UNITS, one little one, or a mixture of both! We can make it happen. We let you provide your own lock for your UNIT so that you know only YOU have the key – no one else. Our Alameda portable storage UNITS aren’t just for moving – they’re also great business solutions. If you need extra warehouse space or on-site storage during peak business seasons, our containers are a great solution. Many of our customers order a UNIT just for the holiday season to store the higher package volume. Our UNITS also come in handy when remodeling or renovating your office space, allowing you to keep inventory on-site without a major disruption in business.